I’m starting to get dates confirmed for my upcoming book tour, so I thought I’d share them with you. I’m going to Chicago. Are you there? Or how about we see each other in Milwaukee. Do you hang out in Texas? We could two-step in Dallas. Tip our hats in Houston. Toast each other in sunny southern California, or say howdy to each other in Atlanta. I’m moving and shaking and signing books all across the US. If I am going to be anywhere near where you live, I’d love for you to come to my signing. I really enjoy meeting my readers. And it is the perfect opportunity for you to ask me questions. But I’ll warn you now, no, I will not give out spoilers! But I might give you a few more clues. April 6, 2013, Zion-Benton Library (hosted by Lake Forest Books), 2400 Gabriel Ave, Zion IL 60099, 1 pm. April 27th, 2013, Edgefest author’s tent, Dallas, TX (Book signing sponsored by A Real Bookstore from Fairview, TX). Look for me at the author’s booth! April 28th, 2013, Book signing at Murder by the Book, Houston, TX at 2 PM. May 4th, 2013, Barnes & Noble, The Woodlands, TX, 2-4 PM. I’ll keep adding new dates and places for book signings to my Events Page as I get the details, so be sure to keep checking there. I’ll also post my appearances on my Facebook page. I am so excited about the upcoming release of Chosen at Nightfall. Kylie has so much going on, and so many challenges she has to face. Not to mention a HUGE decision she must make, to choose between two really hot guys who love her. To promote the release, St. Martin’s Griffin is sending me on a book tour with the wonderful Alyson Noel (The Immortals Series) and Rainbow Rowell (Fangirl and Eleanor & Park). While the dates and locals have not been confirmed, I can tell you that in late March I’m hoping to be visiting Omaha. In early April, you should see us in Chicago, Milwaukee and at several locations in Houston. I’m also going to be signing in Dallas, Atlanta, and Southern California. There are a few other locations, but they haven’t been finalized, so you’ll have to check back here for updates. Now, I promised you a few more teasers for Chosen at Nightfall, so here goes! 1. …finds herself back at the creek with Derek, the place she really started falling in love with him. 2. …discovers someone isn’t who they say they are. 3. …decides to do something she swore she’d never do. Something that totally pisses off Holiday. 4. …has another boy become interested in her. So, there you have it. That’s all I can reveal for now. But I am really looking forward to my book tour, and I hope I’ll be coming to a town near you, so I can say hello. The winner of last week’s giveaway of Shadow Falls: The Beginning (March 5, 2013) is Erica Gamboa. Erica, please email your mailing address to cc@cchunterbooks.com. Congratulations! I wanted to share some news with you. I know I’ve talked about my foreign releases before, but in Germany, they are getting ready to release Taken at Dusk. So I wanted to share the Taken at Dusk page from the publisher’s catalog advertising their summer releases. Isn’t it cool? I am always surprised by how many fans I have there. So, danke, everyone! Well, the next few months are going to be really busy for me. April 23 is the release of Chosen at Nightfall, and I get emails everyday asking who Kylie chooses, Lucas or Derek. But I can’t tell you that! You can ask all you want, but you’ll just have to wait for the release to find out. However, I will give you a few more clues. In Chosen at Nightfall Kylie gets kissed by two guys! And she acquires another stalker. Not to mention she gets caught buying a pregnancy test. 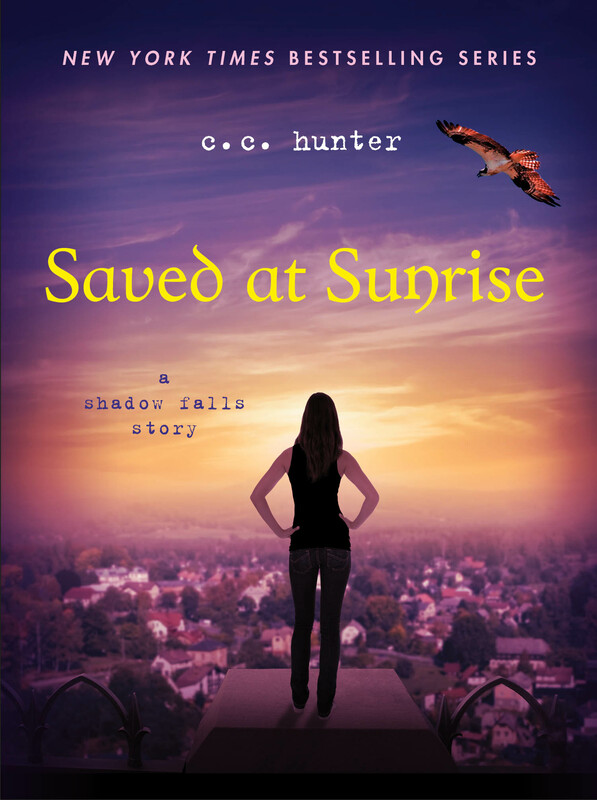 But before the release of Chosen at Nightfall, comes the release of Saved at Sunset, Della’s story. Available on April 2nd, you can preorder it now. for just $1.99. Can’t Wait To Tell You! Most of you know I usually post a new blog every Tuesday. So why am I posting a new blog on Friday? Because this news is so big, it can’t wait till Tuesday! First, I’d like to thank everyone that made the Montgomery County Book Festival such a success. I met so many wonderful people, and I had so much fun teaching my writing class. And a big thanks to everyone that came out to see me. I have the best fans! Next Tuesday, I will be posting some more teasers for Chosen at Nightfall, so be sure to check back next week. Last Tuesday I asked you to go on a little hunt to find the change on my home page. What was it? Well, so many of you have said you couldn’t wait for the release of Chosen at Nightfall on April 30. Well, big news—you don’t have to! 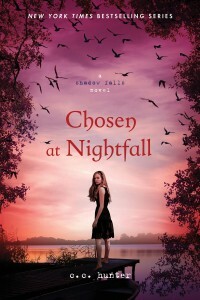 The release of Chosen at Nightfall has been moved up an entire week to April 23! So the answer to Tuesday’s contest was the new release date on my Chosen at Nightfall countdown. Now I realize a week isn’t a huge change, but maybe you can get a head start. On April 2, I’m releasing a novella called Saved at Sunrise. Many of you have begged me for details on what happened between Della and Steve on their F.R.U. mission, and now you will find out. The story is from Della’s point of view and she’s telling all! And let me tell you the sparks are flying between this vampire and shape-shifter. Saved at Sunrise, approximately 100 pages long,—so this isn’t just a short story— will only be released as an ebook and is available for preorder starting today for $1.99 at Amazon and Barnes and Noble. How is that a head start on Chosen at Nightfall? Well you see, as an added bonus, Saved at Sunrise also contains an excerpt which includes chapters 1 and 2 of Chosen at Nightfall! So would you guys like some more good news? I told you I had some great news!! How many of you have emailed me and asked me not to end the Shadow Falls series? Well, how about if we don’t end it? Would that be okay with you? 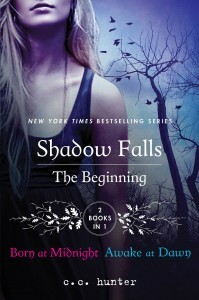 What if we slip into Della’s point of view and keep the Shadow Fall series going? I mean, Della still has a lot of stuff to work out. There are her parents, not mention there’s her beginning romance with Steve. And there’s going to be someone else vying for her attention. Who do you think it could be? Hmm…. And because I really enjoyed writing Della’s Saved at Sunrise story (I mean, it has action, suspense, humor and lots of passion), I had a video done for it. So, as a special treat and to whet your appetite, here’s the video for Saved at Sunrise. 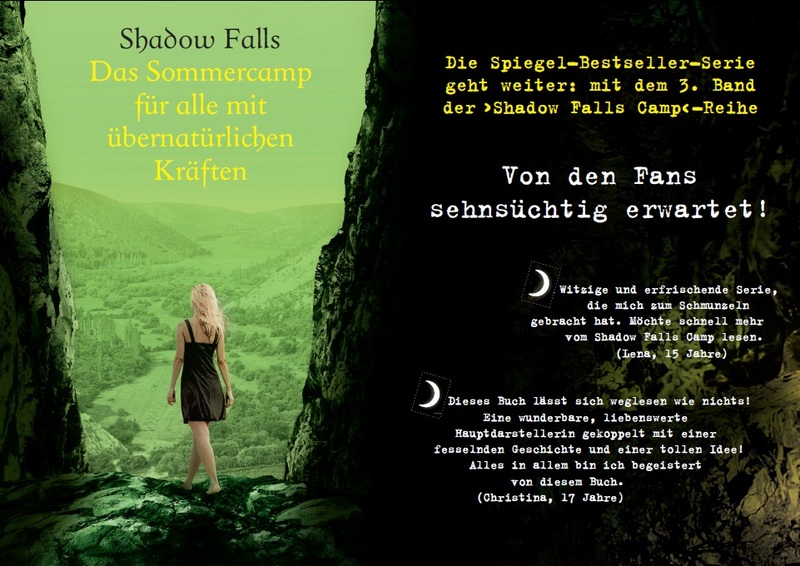 Nestled deep in the woods, Shadow Falls is a secret camp where teens with supernatural powers learn to harness their abilities and live in the normal world. But Shadow Falls is facing a problem that could finally expose them to the rest of the world. Humans are showing up dead and rogue vampires may be to blame. Camp resident Della Tsang, who’s still coming into her own vampire powers, is assigned to help find those responsible. If she succeeds, maybe she’ll even land her dream job: working for the F.R.U., the enforcers of the supernatural world. But when she sees her new partner is the hunky shapeshifter, things get complicated. Steve, too gorgeous to be trusted and capable of seeing through her tough-as-nails exterior, gets under this vampire’s skin. Only hours into the mission, Della realizes rogue vampires aren’t the only threat she’s facing. If she’s ever going to complete her assignment, she’ll need his help…but learning to trust him will be her hardest challenge yet. So many of you spotted the changed date for the release of Chosen at Nightfall! I wish I could give everyone a poster, but I had to select four random names with the correct answers. So the winners are Leanna Ye, Sophia, Savannah King and Madeline Corre . 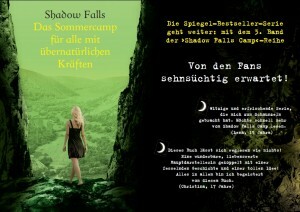 Winners, please email your address to cc@cchunterbooks.com so I can mail you your Shadow Falls poster.